When it comes to getting and staying fit you must A) find a form of exercise that you enjoy and B) clean up your diet in order to reach your goals. The exercise part tends to be the easier of the two, if you spend enough time trying different forms you are bound to find one that you enjoy. The tricky part is knowing what you should and should not be eating. Why is this so important? Let's say it takes you 15 minutes to eat a bagel with cream cheese, that contains 450 calories. In order to burn those 450 calories you would have to walk for 120 minutes. So unfair, I know. But without understanding what you are consuming it may seem as if you are putting in the effort but not seeing the results. One of the first steps in learning about nutrition and what you should and shouldn't be eating is checking your food labels. There is a lot of information that can be ascertained from a food label but I am going to give you the basics below. Calories - At the top of everyones "diet" list is the number of calories that you are consuming. If you are trying to lose weight by a specific date, lets say a wedding or beach getaway, then you will definitely want to ensure that you are burning more calories then you consume. Start by figuring out how many calories you should be consuming (I like this Calorie Calculator) and then just start to observe the number of calories you regularly consume. Serving Sizes - Serving sizes and the number of servings can make things a little tricky. I like to use a bottle of Gatorade for this example. The serving size for Gatorade is 8 oz. but there are 4 servings in a bottle. The label will show that there are 50 calories per serving, which means if you drink the whole bottle you are actually drinking 200 calories. Missing this information can have the calories add up really fast. Fats - The world of good vs bad fats can be confusing. Just understand that Saturated Fats, Trans Fats are the "bad" fats. Example, Organic Almond Butter has a total of 17g of fat. At first glance this can seem like a lot. But if you take another look, only 2.5g are of the saturated kind and there are 0g of trans fats. The remaining 14.5g are of the unsaturated kind and since those are the good fats that are bodies need, then this product becomes less scary. You still have to be mindful of how much you eat due to the almost 200 calories per serving. Sodium - Daily sodium allowance is 2400mg (if no other issues are a concern). This is equivalent to 1 tsp of salt. Check out this Healthline post that shows what half of your daily sodium intake actually looks like. Its rather astonishing. Carbs, Fiber, and Sugar - Looking at the number of grams of carbs in something can also be very tricky. I'm sure you've heard about the good carbs vs bad carbs discussion. For example, a medium apple has 25g of carbohydrates and a donut has 22g. It is not to be concluded that a donut is better because it is lower in carbs. What isn't being looked at is type of carbohydrate and the amount of fiber also in the item. Complex carbohydrates tend to have higher fiber, meaning they don't break down as quickly and keep you fuller for longer. The donut is made up of simple carbohydrates that is mainly made up of sugar and will be broken down very quickly, leaving you hungry for more, which is why eating 3 or 4 donuts is completely doable. Ever try to eat 4 apples? Different story. Protein - Daily protein requirements will vary based on many factors such as age, gender, goals, and training programs. Overall a decent amount of protein on a label is a good thing. General requirements are .36 grams per pound of body weight per day. For example, a 140 lb female should consume 50.4 grams of protein each day. If you break that total down into 5 "meals" that is at an average of 10 grams per meal. Ingredients List - Just because something has a decent amount of protein and not too many calories, does not mean that it is a "health food". Taking a look at the ingredients list will tell you everything you need to know. If the list is full of unidentifiable ingredients that look more like a science experiment, then try and steer clear. I would much rather have heavy cream in my coffee then a processed chemical filled flavored creamer. This is something that everyone must decide upon on their own. Let's compare the donut and the apple a little further. Carbohydrates - Apple has more but is a complex carbohydrate with more fiber. Apple wins. Sugar - Apple has more but it is a natural sugar as opposed to the processed donut sugar. Vitamins and Minerals - Overall the apple has more. Apple wins. This is not a process that will just all of the sudden make sense but as you start to compare and contrast you will be better equipped to make healthier choices. There is a lot of confusion around what is healthy and what isn't, but this simple step will help to shed some light on the process. 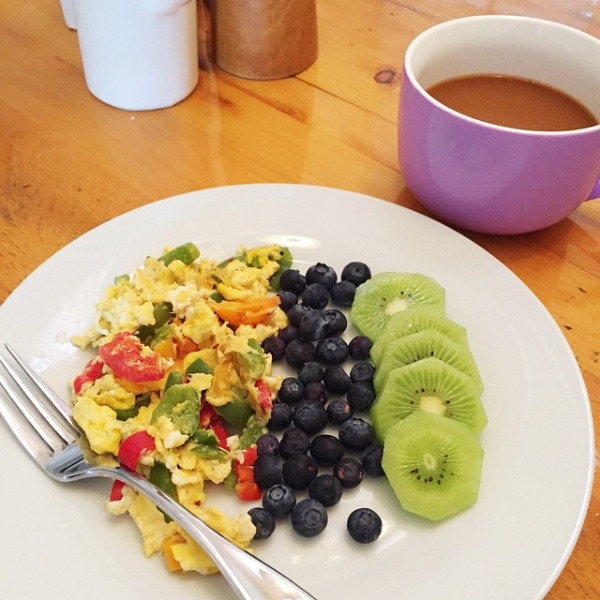 Starting your day with a healthy and filling breakfast provides energy and allows for greater concentration. A brain with no fuel is hard to work with and can result in a morning filled with less than stellar work. When your first meal of the day is a healthy and hearty one, you are more likely to stick to a healthy eating plan. Start with a morning workout and your chances increase. Keep moving your health and wellness goals to the top of your list. A good source of protein - eggs, yogurt, quinoa, chia seeds, protein powders, nuts, nut butters, spinach, kale, hemp powder, non dairy milks, tofu, sprouted breads, leftovers. A good source of fiber - fruits, veggies, oatmeal (my recipe here), high fiber options of muffins, breads, english muffins, waffles, pancakes, and the like. Fiber is what keeps you full. Has staying power - This is directly related to the amount of fiber. If you are hungry an hour after your breakfast, you need more. Maybe more fiber or possibly even more calories. Your breakfast should keep you full for 3-4 hours, and should fall in the range of 250-500 calories depending on your current state and goals. Just add a little at a time until you hit that 3-4 hour mark. Easy to make or grab - When I have the time to make a big breakfast I gladly do so, mainly because it almost always includes bacon! But for the weekdays it is important to get your breakfast down to a science. Pick two or three "go-to" breakfast options and stick to it. I know it might seem boring but the most important part is that you have a healthy option that you enjoy. If you have no time in the morning, and can't find an additional 15 minutes, I suggest pre-making a batch of healthy muffins that you can have with some fruit. Smoothies - I have my smoothies down to a science. Start with some protein, fill with almond or coconut milk and then add all the fun stuff. Chia seeds have both protein and fiber so I accept the seeds in my teeth all day. Oatmeal - This takes about 5 minutes to make and is a blank canvas for whatever your craving. Fruit (fresh, frozen, or dried), nuts, nut butter, cinnamon, vanilla extract, or protein powder for added protein. I also add oatmeal to my smoothies. Toast with peanut butter and a banana - This is my fastest breakfast option. Make it into a sandwich. Pre-made muffins and fruit. Here is one that I have used before. Experiment with different breakfast options and see which ones work best for you. The ones that you really enjoy and keep you full for hours are keepers. Just make sure you have some snacks with you in case you find yourself wandering towards that vending machine. Nutrition Baby Step number two is "Don't drink your calories". Every beverage, other than water, black coffee, and unsweetened tea have calories. I'm not counting diet beverages because I like to act like they don't exist. Diet sodas and the like, make me want to throw things and will require a separate post to express why I despise them so much. Consuming 500 "extra" calories per day (or calories that aren't burned off) will result in a 1 pound weight gain each week. Yes, that's 50+ pounds in a year. As a general rule, I like to stress the quality of high calorie (high sugar/sodium/fat) items. If there is a food or drink that you consume in high quantities it is best to ensure that it is of the highest quality that you can get or afford. For instance, if you rarely consume coffee drinks then the occasional Mocha Latte (about 340 calories) is perfectly fine to use an an indulgence. However, if you have a cup of coffee everyday (or multiple for a lot of people) then I like to stress finding a low calorie, high quality version that meets your needs while saving you the calories. Coffee - I have coffee almost everyday, so I prefer a local or organic coffee. I usually add coconut milk but feel free to use almond milk or low fat milk. I also love using chocolate almond milk :) Another favorite is to add iced coffee to a chocolate breakfast smoothie. After a couple of trips to a Costa Rican coffee farm I fell in love with the flavor of high quality black coffee so I don't use any sweeteners but feel free to use stevia (or any other less processes natural sweetener). Soda - There is no such thing as a healthy soda. If you cannot imagine a day without it then, you my dear are addicted to the sugar/fake sweeteners. I drink sparkling water, ginger ale or La Croix Sparkling Waters if I get a hankering. Juice - Local and/or organic fresh squeezed is your best option. Bottled juices almost always have added sugar and preservatives. This is definitely a quality type situation. Fresh squeezed orange juice is a personal fave. Be careful of lemonades, they are often filled to the brim with sugar! Milk - I do not regularly drink cows milk. I used to drink a lot of it, I loved it! I now alternate buying low fat organic cows milk, chocolate almond milk, and coconut milk. Again, if you cannot imagine not drinking milk (or eating cheese for that matter), you might be addicted. There is actual evidence of traces of morphine being found in animal milk, creating that addictive feeling. Sports Drinks - Sports drinks were created for serious athletes. If you are doing a workout that rivals a professional athletes workout or a lengthy endurance training session then by all means go for it! Otherwise, stick to water. If you are training for something intense like CrossFit or a triathlon, talk to a coach about your proper hydration needs. Alcohol - This one is a doozy. The calories associated with alcohol add up very quickly. And, nine times out of ten, you won't be participating in a workout after you imbibe and will probably consume crap food. Organic red wine and liquor straight up are the best options. My faves include a good Red wine and a really good stout or porter. Be careful of your mixers and of your beer options. This is definitely a case for quality over quantity. Splurge on really good mixers and high quality wine/liquor/beer. You will consume it with a little more respect, take your time, and truly enjoy the process, as opposed to chugging tons of light beer. No matter what you choose, drink water along with your alcohol to help with pacing and to lessen your hangover. Kombucha - Kombucha is fermented green or black tea. It is fizzy and flavored and has become my go-to in many drinking situations as I have recently cut out a lot of alcohol from my life (another blog post perhaps). It is filled with probiotics, b-vitamins, and enzymes. I love it so much I have even begun brewing my own. Be observant of your beverages. Read the nutrition labels and choose high quality for those your drink on the regular. Small swaps can make big changes.